The cave of Legends is the most famous, although it is not particularly spectacular of interesting. It is important because it is so deeply embedded in the island mythology. The cave, which was only accessible by a steep ladder, saw in the wake of the cave tourism trend some major renovation work now has a stable wooden staircase. The cave entrance is around ten meters above the beach and the view across the solemn bay is quite impressive. The cave is approximately 30m deep, excluding a smaller chamber 3m above the main chamber, which has a small exit where rays of sunlight filter through, exuding an Indiana Jones Atmosphere. Thousands of years ago the cave must have had two levels, separated by a sort of floor ceiling, which collapsed. Only a few stalactites and stalagmites grew in this cave. One stalagmite, located at the end is sometimes used as an altar or place where donation to spirits are placed. 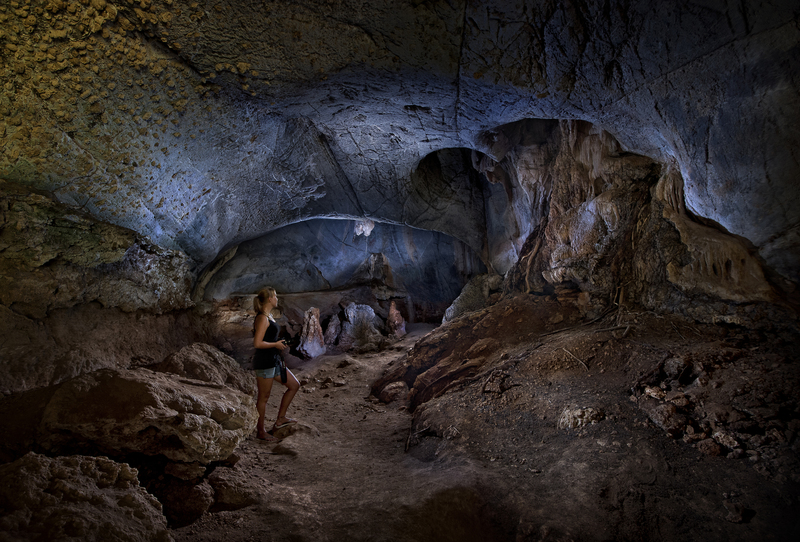 Many caves in Langkawi have spiritual importance, although the local people are rather shy to talk about it. On an island 200m 0ffshore form Gua Cherita, many fern palms of the family Cycadaceae are found. They probably belong to the Cycadaceae pecytinata, Cycadaceae siamensis or Cycadacea clivicola species and prefer the limestone rocks of the northern parts. This plants, known to have Jurassic or even older origin, can reach an age of 2000 years and grow up to 10 m.
This cave is closest to Tanjung Rhu but requires good knowledge of the day`s tides, since the caves closes up during high tide and traps its visitors. The cave is entered through a vertical ascent of approx. 3m after the cave chamber opens up. The chamber is linked with the outside through a narrow hole, which exist into the forest of the island. Gua Buaya is located on one of the side arms of the Kilim River. The cave name indicates that the mangroves in this part of Langkawi were home to saltwater crocodile` decades ago. The same species are kept and bred at the crocodile farm. There is a local legend that tells of the bomoh – local medicine men – who cooperated in confining the crocodile to one remote area, banning them from ever again leaving that place. The current accelerates inside the narrow cave channel and conditions require an experienced boat driver. Limestone outcrops can be seen on the side of the cave while the cave ceiling is literally covered with hundreds of insectivorous bats. These creatures vanish very quickly, once the exhaust fumes of the boat engine get into their noses, into an unexplored cave chamber on the right side. The boat reaches an open up. Until 2002 after a few hundred meters the stream got too narrow and kayaks were required; now, by 2004 a link between this area and Tanjung Rhu in the northern of Langkawi has been established. Gua Teluk Dedap has an interesting history. There is a canyon behind the cave, which is a dolina-collapsed structure. This formed millions of years ago when a huge cave existed and the ceiling collapsed, forming the gorge. As already mentioned, the lake at Dayang Bunting has the same geological history. The cave entrance is always filled with water and at high tide swimming is required in order to enter. Aerial photograph shows that the canyon stretches for more than two kilometers, with rocks framing it up to three hundred meters in elevation. The combination of cave and canyon resulted in an extremely diversified fauna and flora, probably harbouring several endemic species. The fringe of the mangrove forest is covered with ‘Blind the Eye’ trees, while further inside Rhizophora and Sonneratia dominate. The only known person who has been further into the canyon was the British ornithologist Miles Baddeley, a worldwide acknowledged ornithologist and participant at the APECO Conference in October 2003 in Langkawi. This must have been quite an adventure moving between the stilt roots in knee-deep mud. Next to the entrance of the cave, the largest stalactite in Langkawi, said to be several hundred thousands of years old, waits to be admired. There is a steep drop of moss covered rocks welcomes the intruder. The first cave chamber is on a plateau approximately 30m above sea level and can be reached by crossing 30 metres of ankle deep bat droppings. Looking down to the boat, a portal opens on the left side leading to a second chamber, which locals described as several hundred meters long and more than a hundred meters high. This cave would be the largest in Langkawi. There is a possibility the cave ends below sea level. There will be a huge chamber is where the bats, which give the cave its name. The bats were found hanging from the ceiling. Four different species have been identified, all of which are either insectivores of fruitivores, is none of them are vampires. At the end of the chamber, deflected stalactites can be seen which are the result of monsoon winds blowing through the cave and deflecting the water drops during their growth period. There is a second smaller chamber, which was the entrance during the first expedition. Before entering, huge cycads, which most likely belong to the Cycadaceae clivicola species, were found hanging from the cave walls. Gua Pasir Dagang had beautiful stalactites and stalagmites, shimmering like glass with their crystalline cover. Special attention should be given to sharp rocks, which are responsible for some cuts and bruises. This cave is on the way from Pantai Cenang or Kuah to either Pulau Singa or Pulau Dayang Bunting. It located behind the island with the ‘Pregnant Maiden Lake‘and is accessible from the sea. To reach the magnificent inner chamber you walk in a stream for approximately 80 meters. Good shoes are recommended. Some operators ask for the torches to be switched off for a few moments so visitors can experience ‘pitch black’ before returning to the boat, much to a lot of peoples relief.